Bulgarian premier Boyko Borissov will quit next week, he said after his favoured candidate for president lost to a pro-Russia rival. Read more. Kosovo and Serbia have reached an agreement on telecoms under which the International Telecommunication Union, ITU, will allocate the telephone code 383 to Kosovo by December 15. Read more. Only a month before long-awaited early general elections in Macedonia, the main media remain under tight political control, local experts and the EU warn. Read more. Representatives of opposition parties in Serbia will send a request to the management of the national public broadcaster, Radio Television of Serbia, RTS, to report objectively and with equal representation in its broadcasts, Beta news agency reported on Monday. Around 130 migrants from Pakistan and Afghanistan have spent the night in the open near the Serbian town of Sid, on the border with Croatia, regional N1 television network reported on Monday. A group of some 150 migrants started walking from Belgrade on Friday, demanding to be granted entry through Croatia towards Western Europe, but after Croatian border police denied them passage, the migrants stayed near the border in protest. Croatian Interior Minister Vlaho Orepic said on Sunday that he does not see a reason why anyone should pass the border illegally, claiming that the police will defend the border from any illegal entrance of people or goods. Orepic also said that migrants will be received in the refugee centre in Sid. The head of the EU Delegation to Serbia, Michael Davenport, said he is ready to return to the Serbian Assembly and present the EU’s report on Serbia’s progress, now written in the Serbian language, after right-wing opposition parties blocked him from doing so last week because the document was in English, Belgrade-based N1 television network reported on Monday. Serbian President Tomislav Nikolic confirmed on Monday that Russian President Vladimir Putin has approved the sale of six MiG-29 military planes, along with "a contingent" of armoured vehicles to Serbia, Belgrade-based daily Novosti reported. According Novosti, "it is now up to Belgrade to declare itself on this offer from Moscow. For the first time in more than six years, Israel was allowed to participate in a NATO exercise held in Montenegro last week. According to the Jerusalem Post, Israel was a full participant in the wide-scale drill held in Podgorica to evaluate the readiness and capabilities of NATO to face natural disasters. Israel was represented by a joint delegation of rescue and coordination teams from the Zaka rescue and recovery organization, the Fire and Rescue Service and the Defense and Foreign ministries. The European Union plans to invest five million euros to strengthen links between scientific-research community and economy in Montenegro. the EU Ambassador to Montenegro, Aivo Orav, said on Monday that the EU stands side by side with Montenegro to support and advance the scientific and research potential of the country, proof of which is the support to 14 grant contracts with key Montenegrin stakeholders of the scientific and research sector. The newly appointed Turkish ambassador to Bosnia and Herzegovina has met with presidency chairman Bakir Izetbegovic to present his credentials and officially take office. Haldun Koc spoke to emphasize that he would seek to strengthen unity between the two countries given their "deep common history" and "cultural connections". Migrants from Afghanistan and Pakistan who camped out on Serbia's border with Croatia last night tried to break through the makeshift fence erected by Serbian police at around 2pm, regional N1 television network reported. The Greek Football Federation has apologised to Bosnia and Herzegovina for an incident in which a fan at a World Cup qualifying match between the two countries displayed a banner referring to the Srebrenica massacre, Associated Press reported. The match took place in Athens on Sunday and ended with a 1-1 draw. institutions of Montenegro, requesting for them to ask the EU to scrap border demarcation as a condition for EU accession negotiations to be opened. Montenegro," Veseli said after a meeting of the Presidency on Monday. damaging to Kosovo and its citizens. In his first interview since being appointed chief prosecutor of the new Kosovo special court, David Schwendiman told BIRN that suspected criminals are his target, not the Kosovo Liberation Army itself. Read more. After a spate of recent arrests of suspected terrorists, Albanian security experts and some clergy say more must be done to deal with the real threat that returnees from the Syrian war pose. Read more. Russia’s leader can only be satisfied that Donald Trump’s seismic victory in the US has been followed by the victories of pro-Moscow candidates closer to home. Read the comment piece here. Frenzy over arrests in Bosnia is being orchestrated to undermine Croatia’s moderate Prime Minister Andrej Plenkovic, sources say. Read more. 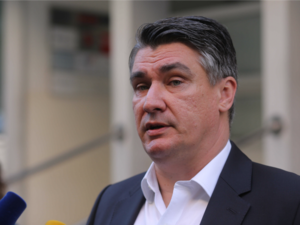 Zoran Milanovic, former Croatian Prime Minister and outgoing president of centre-left Social Democratic Party, SDP, has founded a consultancy company named EuroAlba Advisory with its headquarters in Croatia’s capital, Zagreb. After SDP lost the general elections in September to centre-right Croatian Democratic Union, HDZ, Milanovic announced that he would run to be the president of the party and that he will definitely leave the post after party elections, which take place this Saturday. Alliance for Change, which is the opposition bloc in Bosnia and Herzegovina's Serb-led entity Republika Srpska, has suspended cooperation with the ruling party SNSD. Leader of the Serbian Democratic Party (SDS), Vukota Govedarica, said the opposition was also considering leaving the RS parliament, according to local media. Govedarica said that RS President Milorad Dodik, leader of the SNSD, acted like a "classic dictator" and said there would be no cooperation with him. The Croatian parliament’s Committee for Prevention of Conflicts of Interest will further investigate a case involving new Economy Minister Martina Dalic and a potential conflict of interest related to her husband’s position, Croatian news site Index reported on Monday, quoting sources from the Committee. Dalic’s husband is a member of the executive board of the partially state-owned energy company INA, for which the government can pass decisions on. Representatives of Belgrade-based Centre for Euro-Atlantic Studies, CEAS, walked out of the National Convention on the EU on Monday, because the body did not react to the systematic campaign from pro-government media and MPs from the ruling Serbian Progressive Party against civil society organisations, Serbia’s N1 television network reported. “The reason for stepping out of the National Convention of the EU is the lack of reaction on the permanent campaign of criminalisation and de-legitimation of the NGO’s from the pro-government media and MPs of the ruling party,” CEAS said in a written statement, N1 reported. Image of what the new resort of Kosovo politician and businessman, Behgjet Pacolli, which will be built in the Divjaka area on Albania’s central coast, will look like were published on the Albanian Albeu portal on Tuesday. The resort, which the construction of is expected to start soon, will be comparable with others in the popular tourist destinations of Dubai in the United Arab Emirates and Antalya in Turkey, Albeu claimed. Croatia’s centre-right Croatian Democratic Union, HDZ, will refrain from voting on whether Serbia’s governing centre-right Progressive Party, SNS, should become a member of the European People's Party, EPP, Croatian Prime Minister Andrej Plenkovic announced on Thuesday. The centre-right EPP gathers over 70 national parties from 40 countries. EU Enlargement Commissioner Johannes Hahn voiced his worry on Tuesday about the potential rise of nationalist rhetoric in Serbia during the country’s presidential election campaign which will take place in 2017, RTS 1 television network reported. 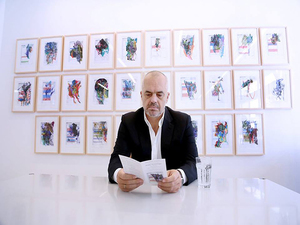 Albanian Prime Minister Edi Rama’s artistic prowess is garnering him a bout of international attention, with the UK’s Guardian running a feature on the premier after one of New York’s leading galleries recently opened an exhibition showing his work. While Rama’s work might be new to American audiences, he has previously held exhibitions in Europe and Asia during his three-year tenure as prime minister, while some local artists have criticised him for using his position to promote his art. Albanian police found a burned motor boat and 224 kilograms of cannabis in the Karaburun peninsula on Tuesday. The smugglers, who were trying to transport the load from Albania to Italy when their boat was detected by Albanian police and their colleagues from the Italian financial police force, burned the boat and fled. Police are still searching for them. Sarajevo City Council has voted to strip a university professor of a plaque that recognised his achievements. Professor Ali Lafcioglu was picked for the award in October, but Mayor Ivo Komsic asked the council to reconsider its decision. Professor Lafcioglu works for Bosna Sema, an educational organisation that has come under pressure as Turkish authorities claim it is linked to the Gulen movement - a network the Turkish state says was responsible for January's attempted coup in Turkey. In his reasoning, Mayor Komsic reportedly said the award could harm Turkey-Bosnia relations. 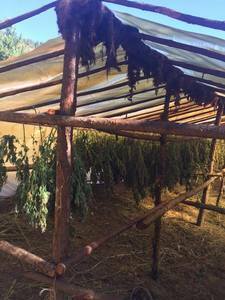 Albania is uprooting cannabis at an unprecedented rate, but endemic corruption and a failure to target the kingpins behind a multi-billion-euro industry give the lie to the NATO member’s ‘war on drugs’. Read the full investigation. Less than a week before the start of Macedonia’s election campaign, political discontent appears to be growing among the country’s large Albanian minority, observers said. Read more. Elected president because of his lack of involvement in Bulgaria’s murky politics, former air force chief Rumen Radev will quickly have to learn to navigate the country through turbulent times. Read more. Serbian police have arrested ten people after discovering huge quantities of TNT and plastic explosives alongside hand grenades and rifles in Sombor and Apatin in Serbia’s northern province of Vojvodina, Serbia’s Minister of Internal Affairs, Nebojsa Stefanovic, stated on Wednesday. “It is really a huge amount of weaponry that the group sold,” Stefanovic said, television network N1 reported. 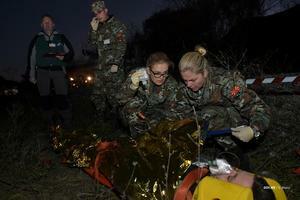 Stefanovic claimed that the criminal group was using the explosives and arms in an illegal trade, N1 also reported. The United Nations Security Council will discuss on Wednesday the quarterly report of Secretary General Ban Ki-moon on developments in Kosovo, RTK reports. During the reporting period, political tensions centred around the dispute over the draft law ratifying the agreement on territorial delineation with Montenegro and the adoption of a new law on the Trepca mining and industrial complex. US Drug Enforcement Administration, DEA, is now operating a regional office in Zagreb that will tackle drug-related crimes in cooperation with Croatian police and the Office for Suppressing Corruption and Organised Crime, USKOK, Croatian media reported on Wednesday. The US ambassador to Croatia, Julieta Valls Noyes, announced the official opening of the DEA’s regional office on November 8 via a tweet. 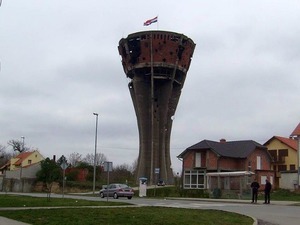 The Croatian government decided that it will give the remaining 1.6 million euros needed for the reconstruction of Vukovar's water tower - a symbol of the Croatian eastern town besieged and heavily destroyed by the Yugoslav People's Army and Serbian paramilitaries in 1991, regional N1 television network reported on Wednesday. Early this morning in Banja Luka, the administrative centre of Bosnia's Serb-led entity Republika Srpska, Ministry of Interior police arrested eight people. According to local media, the arrests were carried out by anti-organized crime police and were in connection with robberies and murder. 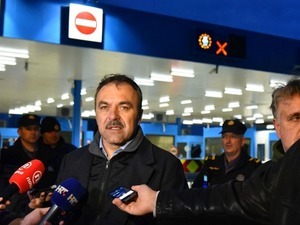 Croatia's defence minister Damir Krsticevic arrived in Bosnia and Herzegovina today to meet his counterpart, Marina Pendes. He told local media he had no problems coming into the country, addressing recent claims that he could be arrested in connection with alleged war crimes in western Bosnia in 1995. Andrija Mikulic, president of the Zagreb branch of the governing centre-right Croatian Democratic Union, HDZ, told media that the capital’s committee for renaming neighbourhoods, streets and squares refused his party’s proposal to rename a square that is currently named after Yugoslav President Josip Broz Tito. 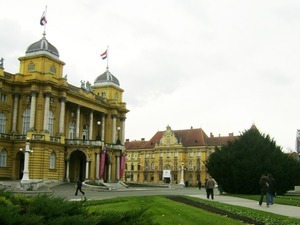 The HDZ and two marginal right-wing parties proposed that Marshall Tito Square in central Zagreb be renamed Theatre Square, as the Croatian National Theatre is located there. Mikulic said the HDZ proposed the change now because it did not want it to become an issue during the local election campaign in spring, but insisted that his party will continue to advocate the initiative. After Croatia’s Agriculture Ministry stated on Wednesday that salmonella was found in chicken and duck meat in two stores of the German supermarket chain Lidl, the company has claimed it is not responsible for the contamination of the product. In its response to the claims, Lidl said that the two cases of contamination were revealed after the company sent the samples of meat to a laboratory and informed the Agriculture Ministry upon getting a positive result on salmonella. Lidl also claimed it was not responsible for the contamination of the meat, since the supermarket chain buys its meat already packed. According to the ministry's investigation, the chicken meat came from Poland while the duck meat was from Hungary. During his visit to Albania’s capital, Tirana, on Wednesday, Director General for Enlargement at the European Commission in Brussels, Christian Danielsson, emphasised that every decision on opening the country’s EU accession negotiations now depends on the Albanian political establishment. 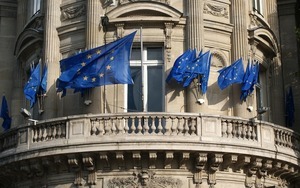 The European Commission recommended for accession negotiations to be opened with Albania at the beginning of November, but on the condition that tangible progress be made in the implementation of the country’s justice reform, particularly in terms of the reevaluation of judges and prosecutors under the so-called “vetting law”. 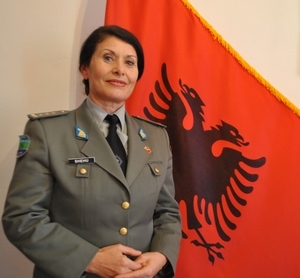 Manushaqe Shehu has become the first female General of the Albanian Armed Forces, 104 years after its creation. Albania’s President, Bujar Nishani, decreed that Shehu, formerly a commandant, would become the next General on Wednesday, after she was proposed for the position by the Albanian Defence Minister, Mimi Kodheli. General Shehu, who was born in 1965 and is a mother of two, has served 32 years in the country’s military in a range of duties during that time, including in finance and advising. The Albanian Army became part of NATO in 2009. If Pristina does not respect the telecommunications agreement made with Belgrade, Serbia could recall the international dialing code that has been given to Kosovo, the head of the Serbian government’s Kosovo office Marko Djuric said, daily Politika reported on Wednesday. “If Pristina is interfering with the free work of [Serbian telecoms company] Telekom or influence on the disposition of its property, Serbia is reserving the right to withdraw dial number for the geographic district [Kosovo], which we temporarily concede to institutions in Kosovo,” Djuric said. 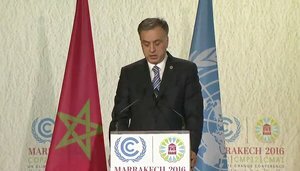 The President of Republika Srpska, Milorad Dodik, was questioned on Wednesday as a witness in connection with the criminal charges filed by the Association of Victims and Witnesses of Genocide and Movement and the Mothers of Srebrenica and Zepa Enclaves victims’ group over alleged incitement of national, racial and religious hatred, discord or intolerance. Dodik was questioned by the State Investigation and Protection Agency, SIPA, and the information was confirmed by the Bureau for Public Relations of the President of Republika Srpska. US president-elect Donald Trump named a Bosnian Croat, Mira Radielovic Ricardel, as a member of his team for the transition to the White House, Associated Press reported. Originally from the municipality of Breza in central Bosnia, Radielovic Ricardel was the assistant to former US defence minister Donald Rumsfeld and assistant to the vice-president of the Boeing branch producing military planes. Police in Kosovo said on Wednesday they had arrested 19 people in the past 10 days on suspicion of having links with Islamic state and planning to carry out attacks in Kosovo and in neighbouring Albania, Reuters reported. Police said the suspects were in contact with an Islamic State member, the self-declared "commander of Albanians in Syria and Iraq", Lavdrim Muhaxheri from whom they received orders to attack. "They were planning to commit terrorist attacks in Kosovo and also (an attack) against Israeli football team and their fans during the Albania-Israel match," Kosovo police said in a statement in the evening. The Serbian defence minister called on army members to show solidarity in a ‘tough economic situation’ as the union representing military personnel said it plans to stage the first-ever public protest by soldiers in the country over poor working conditions and low wages. Read more. The election of a ‘pro-Russian’ president may have piqued the Western media but Rumen Radev’s victory will not change the fundamentals of Bulgaria’s external allegiances. Read more. Macedonians said democratic freedom and prosperity are the big issues that will determine how they vote in the December elections - but they remain divided over which one is most important. Read more. Serbian police have arrested a person in Belgrade over death threats made against journalists from N1 television network, the media outlet reported on Thursday. "Due to the existence of suspicion that he committed the crime of endangering security, the suspect will be held in custody for 48 hours after which he will, with criminal charges, be brought to the Special Prosecutor's Office for the fight against cybercrime," the police statement read. Members of the three unions in Serbia representing the education sector have begun a strike on Thursday, demanding that the government increase their wages, Belgrade-based TV N1 reported on Thursday. The strikes are being held in over 1,500 schools, with teachers shortening the length of classes to express their dissatisfaction over salaries. 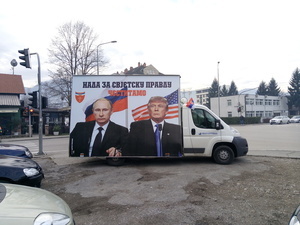 A truck with a congratulations message for US president-elect Donald Trump and Russian President Vladimir Putin has been spotted today in the streets of Banja Luka, the administrative centre of Bosnian entity Republika Srpska. It says: "Hope for justice in the world. Congratulations." Presenting his report on the UN Mission in Kosovo to the Security Council, Special Representative of the Secretary-General and the head of Mission, Zahir Tanin, stated that the accelerated passage of the new law on the Trepca mining complex is another obstacle that has emerged in the dialogue between Pristina and Belgrade. 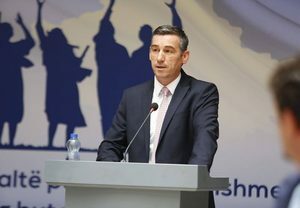 While Tanin mentioned that the tense political situation between Kosovo’s ruling and opposition parties had eased in recent months since the law was passed, he highlighted that their differing positions are still just as entrenched, and the general political atmosphere remains deeply polarised. “For Kosovo this is unfortunate,” Tanin said. Tanin also mentioned the death in custody of Vetevendosje activist Astrit Dehari as an example of another issue that had arisen in the country. Kosovo’s government has adopted a concept draft of a new law on pensions for war veterans and other military categories which foresees annuities to be paid by the state budget. "Taking into account the budget planning of 2017, and numerous of consultations with veterans, we consider that the amendment of this law is necessary," the Minister of Labour and Social Welfare, Arban Abrashi, said on Wednesday. On the list of veterans eligible for pensions, there are currently 28,000 former Kosovo Liberation Army members. In October, the government allocated 1.6 million euros from the state reserves for the payment of September’s pensions. More than 80 people will officially work as whistleblowers in high administration positions in Albania after the government adopted the measure on Wednesday in a bid to clamp down on corruption. The decision will be enacted by the end of this year, and the general rule is that every central institution will need to have two people appointed to denounce any wrongdoing. 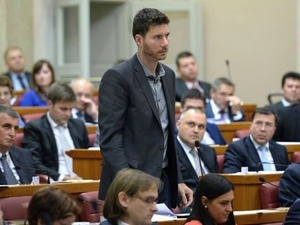 Ivan Pernar, new Croatian political star and MP of the anti-establishment Living Wall party, called for a break in parliament's session on Thursday, because Marijan Hanzekovic, a lawyer and the owner of Hanza Media, has sued him over insults he allegedly made against him personally. During the break, Pernar told N1 regional TV network that the parliamentary Credentials and Privileges Commission will discuss whether his parliamentary immunity should be removed so the lawsuit can go to court. Pernar emphasised that there were previous examples of MPs having their immunity removed for lawsuits over insults, but concluded that “the blood of Jesus” protects him. The trial of Macedonia's former Prime Minister, Nikola Gruevski, which was supposed to start next Monday in the capital, Skopje, has been postponed until after the December 11 elections due to the announced absence of one of the defendant's lawyers. The Special Prosecution indicted Gruevski, who is the leader of the ruling VMRO DPMNE party, for allegedly ordering an attack on the opposition mayor of the Centar municipality in Skopje, Andrej Zernovski, during protests in front of the municipal HQ in 2013. 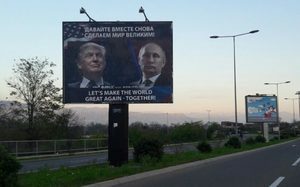 A billboard poster of the US president-elect Donald Trump and Russian president Vladimir Putin has been placed on a busy road in the town of Podgorica by a shadowy pro-Russian in Montenegro called In4s. Photo: Courtesy of web portal in4s. Delegations from Kosovo and Serbia continued talks in Brussels on Thursday on the enforcement of the agreements made under the telecoms deal reached on Sunday, spokesperson for EU Foreign Affairs and Security Policy Maja Kocijancic said. “We support the agreement that was reached on Sunday. Both sides in Brussels are talking about details that would lead to application of the agreement,” said Kocijancic, Serbian news agency Tanjug reported. One of the main obstacles facing Rudy Giuliani, the vice chairman of the Trump Presidential Transition Team, in his bid for the position of US Secretary of State could be his connection with the leaders of the Serbian Progressive Party, headed by Aleksandar Vucic, the Associated Press reported on Thursday. Giuliani met with Serbia’s Prime Minister Vucic and President Tomislav Nikolic in 2012, who were both considered at that time to be connected to the regime of Serbian strongman Slobodan Milosevic. The Croatian parliament’s Credentials and Privileges Commission decided not to remove parliamentary immunity from MP Ivan Pernar over a private lawsuit filed by lawyer and owner of Hanza Media Marijan Hanzekovic for alleged insults Pernar made against him. Pernar thanked his colleagues for making the decision in his favour and said that people today "aren't killed physically, but through the media". Another case of salmonella was found in meat on the shelves of a Croatian supermarket store after two earlier cases were detected in products on sale in the German Lidl chain, Croatia’s Agricultural Ministry reported on Thursday. The latest case of salmonella was found in veal meat in a store of Croatian retail supermarket Konzum in the coastal city of Rijeka. Croatian 1990s wartime general Ante Gotovina has been named as Defence Minister Damir Krsticevic’s special adviser for creating a homeland security system, the government said on Thursday. 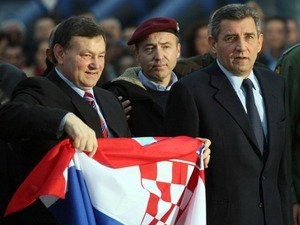 The International Criminal Tribunal for the Former Yugoslavia acquitted Gotovina in 2012 of committing crimes against Croatian Serbs during and after Croatia's military operation 'Storm' in August 1995. A Bosnian version of the Islamic State’s new magazine is aimed at justifying violent deeds to poor and unemployed people it hopes to attract, according to an expert spoken to by BIRN. Read more. Simmering tension in Skopje's Criminal Court over the contoversial Court President, Vladimir Pancevski, has burst into the open since a number of fellow judges publicly demanded his removal. Read more. Lavdrim Muhaxher, commander of Albanian ISIS fighters, has been named a serious threat for Kosovo once again after 19 suspected terrorists were arrested within days. Read more. Premium Highlights: Are elections in the Balkans turning into a proxy war between Putin and the West in which the former is on a winning streak, or is this just a narrative the international (and regional) media find more interesting than the complexities of domestic politics? Our weekly roundup for November 11 - 17 looks at this and much more! Read more. An image of a paramilitary kicking a Muslim woman after she was shot by Serb forces led by warlord Zeljko ‘Arkan’ Raznaovic in Bijeljina in Bosnia in 1992, photographed by Ron Haviv, has been included in Time magazine’s list of the 100 most influential photos ever. “Haviv had gained access to the Tigers, a brutal nationalist militia that had warned him not to photograph any killings. But Haviv was determined to document the cruelty he was witnessing and, in a split second, decided to risk it,” Time reported. The picture “ignited broad debate over the international response to the worsening conflict [in Bosnia and Herzegovina]”, it argued. At least 5,827 telephone numbers in Macedonia were unlawfully wiretapped in the period 2008-2015, the Special Prosecution, SJO, told a press conference on Friday. The announcement was made during the launch of a new investigation, codenamed “Target”, in which ten persons from the Secret Police are suspected of misuse of office, including top-ranking officials. 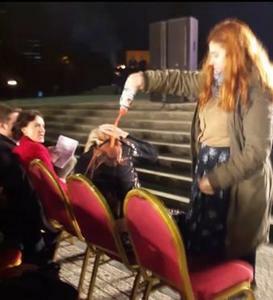 After squirting tomato ketchup on Albania’s Minister of Education, Lindita Nikolla, on Thursday evening, a young Albanian activist from the For University movement, which objects to the country’s higher education reforms, was detained by police. The ketchup attack took place during a graduation ceremony for law students hosted by the ministry in the capital, Tirana. The activist, a student who has been protesting the reforms since 2014 alongside others in the movement, was released after ten hours. At a press conference today about a new investigation linked to Macedonia’s mass illegal wiretapping scandal, the Special Prosecution, SJO, singled out three journalists, including BIRN’s Meri Jordanovska, among those who were unlawfully tapped for more than a year. The SJO’s new investigation, codenamed “Target”, suspects ten people from the Secret Police misused their office, including top-ranking officials.